From past couple of years, Samsung is continuously launching the successors of its ‘J’ series devices. For Example, the Galaxy J5 and J7 launched in 2015, but Samsung also launched J5 2016 & J7 2016 last year. 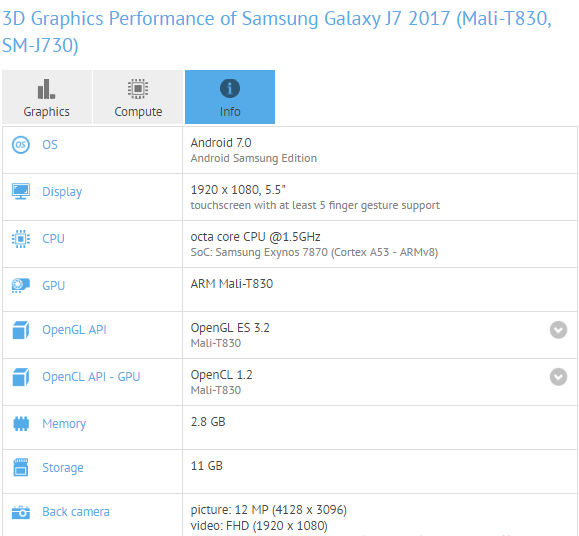 Now, the company is going to launch the Samsung Galaxy J7 2017 and today, the details of the device revealed via GFXBench. Most of the specifications like Android Verison, Processor, GPU, Cameras, and Memory have leaked today. Starting off with the display, the phone has the same 5.5-inch 1080p display with at least five finger gesture support. It is powered by an Exynos 7870 Chipset which is an octa-core chip clocked at 1.5GHz along with the Mali-T830 GPU. There is 3GB RAM and 16GB internal storage from which, 11GB is available for the user. The phone runs on Android 7.0 Nougat out of the box with company’s TouchWiz UI. Coming to the cameras, the Samsung Galaxy J7 2017 packs 12MP rear camera with AF, Face Detection and LED Flash. On the front, the phone has got the same 12MP sensor, and both the cameras can shoot videos up to 1080p resolution. The phone packs sensors like accelerometer, compass. GPS, Gyroscope, Light Sensor, Proximity and not to forget the NFC. The only thing that is left now of the device to know is the design, and hopefully, we will get more details very soon. Stay Tuned.